The Israeli government is holding closed-door meetings about receiving some 6,000 Jewish citizens who have been displaced due to the Ukrainian civil war, reports the Israeli Maariv newspaper. Meanwhile, western support for overtly National Socialist and Ultra Nationalist parties and militants in Ukraine continues. The cabinet of Israeli Prime Minister Benjamin Netanyahu secretly plans on the construction of “refugee camps” to receive the “6,000 displaced” Ukrainian Jews, reports Maariv. 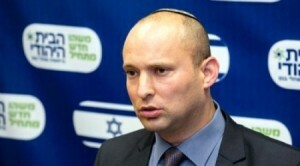 The construction of refugee camps to receive the 6,000 Ukrainians is reportedly being planned under the supervision of Israel’s Minister of Economy, Naftali Bennett. Maariv didn’t specify where these 6,000 Ukrainians should be settled. The news comes as the death toll of a recent attack on a Jewish Synagogue in Jerusalem has risen to five and a row between the Netayahu government and the Palestinian government under President Mahmoud Abbas. While Netanyahu blames Fatah and Hamas for terrorism and for the attack, Palestinian President Mahmoud Abbas responded, blaming Israel’s occupation of Palestine for causing conflict and driving people into terrorism. The rapid spread of ultra nationalism, overtly Nazi Parties and militia, and their rapid rise to power during the Western-backed “Euro-Maidan” protests in Kiev has resulted in pogroms and threats against Jews and Jewish communities throughout Ukraine with the exception of the areas in the rebelling Donbass region which are firmly under the control of the rebelling regional governments, as well as with the exception of Crimea, which acceded into the Russian Federation after a referendum in Crimea on March 16, 2014. Ukranian M.P. for Svoboda, Oleg Tyahnbok, here after his reelection as Svoboda “Leader”. Originally known as the Social-National Party, Svoboda is rooted in Nazi collaboration. Svoboda also honors “Ukrainian veterans” who fought with the Nazis against the Soviet Union during the Second World War in the Waffen SS-Galicia and the party is fighting against a threat which they describe as “Jew Communism.” The issue has been described in an article by Michael Goldfarb in the Global Post, titled “Ukraine’s nationalist party embraces Nazi ideology“. The also overtly National Socialist paramilitary UNA-UNSO, associated to Ukraine’s Pravy (Right) Sector, has since morphed into the so-called “special military units” or ADS corps which are operating semi autonomously, and are associated to command structured within Pravy Sector, the Interior Ministry, the Defense Ministry as well as foreign and NATO intelligence. The UNA-UNSO has been linked to NATO’s so-called stay-behind a.k.a. “Gladio” network. Senator John McCain (r) here with Svoboda leader Oleg Tyahnbok (m) and current Ukrainian PM Arseniy Yatzenyuk (l). The U.S. and other western governments have consistently passed their “partners” in Ukraine off as “moderates and rejected allegations about cooperation with Ukrainian parties and organizations with Nazi ideology. In May 2014, the U.S. Assistant Secretary of State, Victoria Nuland, however, admitted during a two-hour hearing before the House of Representatives, that the U.S. Administration cooperates with Ukrainian Nazis. The cooperation with Ukrainian Nazis was, however, not limited to official members of the Obama administration. Among those directly involved in cooperating with e.g. Svoboda “leader” Tyahnbok was U.S. Senator John McCain, who is also known for making “deals” with ISIS “Caliph Ibrahim“, a.k.a. al-Badri or al-Baghdadi. Israeli military units were reportedly also involved in the coup d’état in Ukraine that lead to the rise of Nazi ideologists and the threat against Jewish citizens and communities in Ukraine. In an article from march 14, 2014, the director of the Canada-based Centre for Research on Globalisation, Dr. Michel Chossudovsky, noted that the Jewish News Agency JTA reported about the presence of units associated to the Israeli Defense Forces (IDF) in Ukraine. JTA quotes “Delta”, a member of the IDF’s Givati Infantry Brigade as confirming the presence of Israeli forces during the coup d’état. The Givati Infantry Brigade was, among others, involved in Israel’s 2009 “Operation Cast Lead” against Palestine’s Gaza Strip as well as in massacres in Tel El-Hawa neighborhood of Gaza, reports Chossudovsky. While the threat against members of Ukraine’s Jewish community is real, the situation poses the question whether the Netanyahu administration participated in creating the threat with the purpose to create potential new Israeli immigrants and citizens. Over the last two years, Israel experienced a marked increase of Israeli citizens who are leaving Israel for Germany, the USA, and other western countries. 6,000 new Ukrainian Jews could help the Netanyahu administration with maintaining Israel’s policy of aggressive settlement expansion in the illegally occupied Palestinian territories.